Hydrogen halides are diatomic inorganic compounds with the formula HX where X is one of the halogens: fluorine, chlorine, bromine, iodine, and astatine. 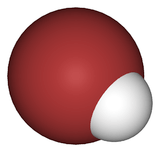 Hydrogen halides are gases that dissolve in water to give acids which are commonly known as hydrohalic acids. The hydrogen halides are diatomic molecules with no tendency to ionize in the gas phase (although liquified hydrogen fluoride is a polar solvent somewhat similar to water). Thus, chemists distinguish hydrogen chloride from hydrochloric acid. The former is a gas at room temperature that reacts with water to give the acid. Once the acid has formed, the diatomic molecule can be regenerated only with difficulty, but not by normal distillation. Commonly the names of the acid and the molecules are not clearly distinguished such that in lab jargon, "HCl" often means hydrochloric acid, not the gaseous hydrogen chloride. Hydrogen chloride, in the form of hydrochloric acid, is a major component of gastric acid. Hydrogen fluoride, chloride and bromide are also volcanic gases. The direct reaction of hydrogen with fluorine and chlorine gives hydrogen fluoride and hydrogen chloride, respectively. Industrially these gases are, however, produced by treatment of halide salts with sulfuric acid. Hydrogen bromide arises when hydrogen and bromine are combined at high temperatures in the presence of a platinum catalyst. The least stable hydrogen halide, HI, is produced less directly, by the reaction of iodine with hydrogen sulfide or with hydrazine. 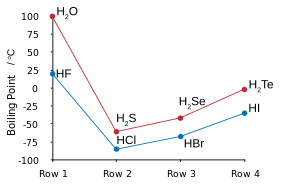 Comparsion of the boiling points of hydrogen halides and hydrogen chalcogenides; here it can be seen that hydrogen fluoride breaks trends alongside water. 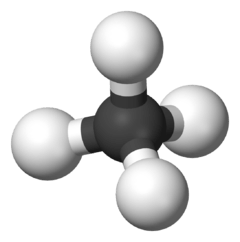 The hydrogen halides are colourless gases at Standard Temperature and Pressure (STP) except for hydrogen fluoride, which boils at 19 °C. 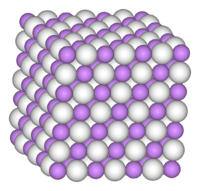 Alone of the hydrogen halides, hydrogen fluoride exhibits hydrogen bonding between molecules, and therefore has the highest melting and boiling points of the HX series. From HCl to HI the boiling point rises. This trend is attributed to the increasing strength of intermolecular van der Waals forces, which correlates with numbers of electrons in the molecules. Concentrated hydrohalic acid solutions produce visible white fumes. This mist arises from the formation of tiny droplets of their concentrated aqueous solutions of the hydrohalic acid. Upon dissolution in water, which is highly exothermic, the hydrogen halides give the corresponding acids. These acids are very strong, reflecting their tendency to ionize in aqueous solution yielding hydronium ions (H3O+). With the exception of hydrofluoric acid, the halogen halides are strong acids, with acid strength increasing down the group. Hydrofluoric acid is complicated because its strength depends on the concentration owing to the effects of homoconjugation. As solutions in non-aqueous solvents, such as acetonitrile, the hydrogen halides are only modestly acidic however. 1 2 Greenwood, Norman N.; Earnshaw, Alan (1997). Chemistry of the Elements (2nd ed.). Butterworth-Heinemann. ISBN 0-08-037941-9. This article is issued from Wikipedia - version of the 11/25/2016. The text is available under the Creative Commons Attribution/Share Alike but additional terms may apply for the media files.